I cannot get the kimchi recipe out of my Korean-American boyfriend’s mother. I ask Dan for his mom’s amazing kimchi recipe, he heads to his parents' house for a family dinner with his mission cut out for him, and he returns with six gallons of the stuff—but never a recipe. That’s because “kimchi” is a term that encompasses a whole genre of food—like “sandwich.” And for many, including Dan’s mom, making it doesn’t require a recipe (or even measuring spoons). 1. Gather equipment and ingredients. Many Korean families have a mini fridge just for their kimchi—I’ll call that optional. You will need a very large bowl (plastic, glass, doesn’t matter) or plastic tub. That’ll be the place where you salt and prep your vegetables—oh, you’ll need a considerable amount of coarse salt, too. Think about how you’ll store your kimchi: Plastic containers will retain the orangey-red color and garlicky smell of the kimchi. Mason jars can work, or you can find a gallon-sized glass jar online, if not at a local kitchenwares shop, to store your whole batch. Then, think about what you’re going to turn into kimchi. Those items that make you say, “What am I going to do with all of this! ?” They’re usually great candidates. After napa cabbage, radishes take the number two spot on the kimchi totem pole. (Think daikon, not spicy French radishes.) You can julienne a large radish with a mandoline or cut it into cubes. Other great options are cucumbers (slice large ones in rounds and small ones in quarters lengthwise), zucchini, squash, tough leafy greens, or scallions. Those would be the traditional choices, but there’s nothing stopping you from testing out other farmers market finds. As you’re shopping, eyeball about a gallon’s worth of veg—that’s a good amount to start with for your kimchi adventure. You can also mix and match what you decide to kimchi: Watercress, daikon, and scallions all in one jar? I’m not stopping you. Things that won’t work would include anything with too distinct a flavor (beets, most fruits—kimchi’s powerful flavor doesn’t play well with others), or anything too dense to tenderize during marinating (carrots are tricky, for example, unless they’re julienned). Something briny: Saeujeot (새우젓), or tiny shrimp, taste great. If you’re looking for a vegan or vegetarian version, soybean (miso) paste is a trusty umami substitute. In Korean, this is called doenjang (된장). It’s slightly more salty and funky than its Japanese cousin. Some folks use raw squid or oysters or dashima (kombu), too. Something spicy: Get plenty of Korean chili flakes (gochugaru, 고추가루) to achieve the signature spice. They’re dried and ground to achieve just the right flavor and texture, but any ground red chiles without added flavoring could work. In addition to these “specialty” ingredients, you’ll also need to collect: one white or yellow onion, an apple or Asian pear, lots of garlic, some ginger, a carrot, and scallions. 2. Prepare the vegetables and get layering. Now, clean up your vegetables. Depending on what you’re fermenting, preparation can differ. The goal here is to get everything thoroughly covered when marinating, but to keep some texture intact. If using cabbage, trim tops of leaves, cut in half, and remove the core, separating out each leaf. Green onions and leafy greens are usually left whole. If using daikon radish, peel and cut into cubes. 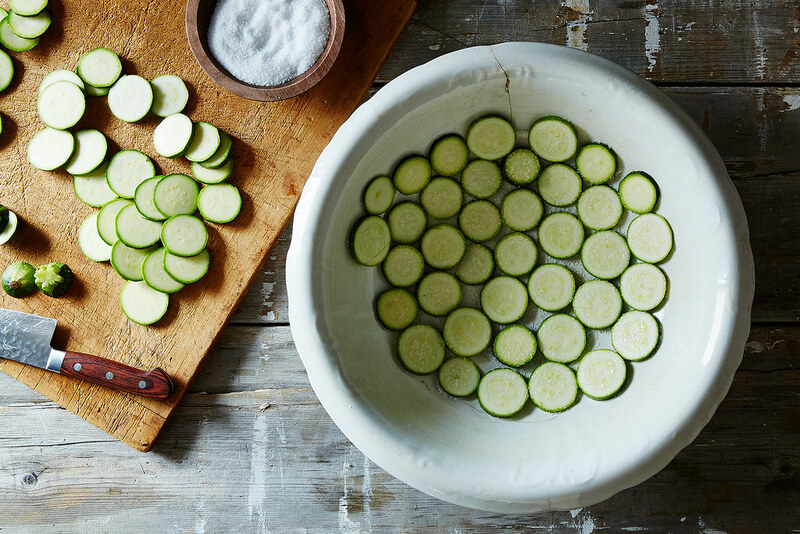 If using cucumbers or zucchini, large ones can be cut into rounds and small ones into quarters lengthwise. Next, pack in a single layer of your prepared kimchi base (cabbage, radish, or whatever you’ve chosen) into your large container/tub. Sprinkle with coarse salt and repeat until you’ve layered in and salted all of your vegetables. Be careful not to go salt crazy; you’re just using enough to remove some moisture and clean the vegetable, not enough to create a super-seasoned kimchi. Let the salted vegetables sit for 3 to 4 hours at room temperature. You can cover with plastic wrap or clean kitchen towels if you’re concerned about cleanliness, but it’s not necessary. Meanwhile, you can get to work on the seasoning. 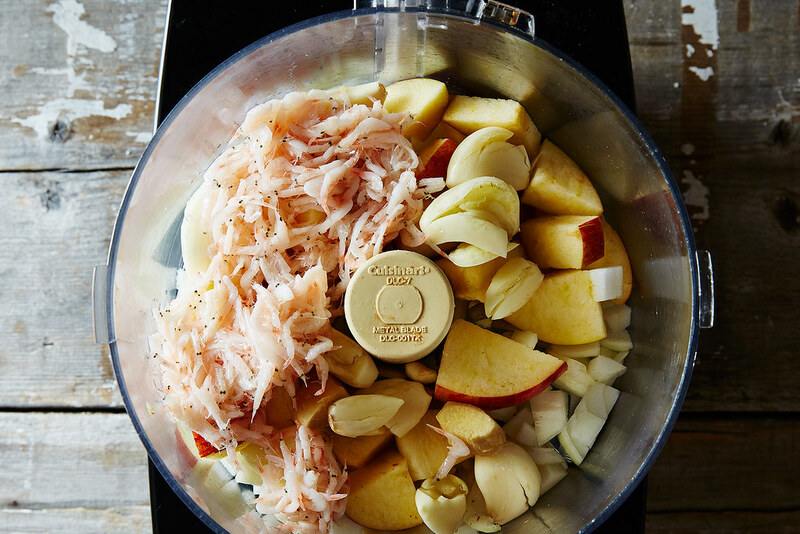 Combine roughly chopped onion, chopped apple or pear, and two small palmfuls of your briny addition (Saeujeot, miso) to a food processor. Toss in a knob of chopped ginger, about the size of your pinky finger. 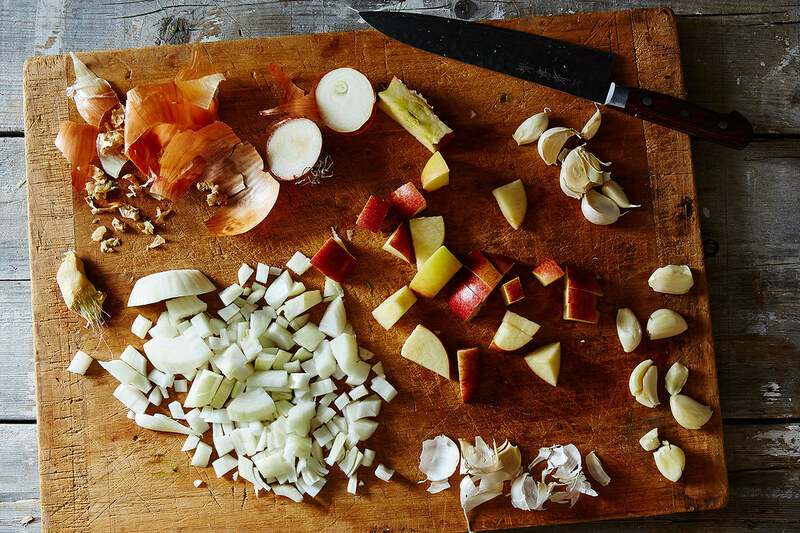 Finally, go garlic crazy. About 10 peeled cloves should be added to the mixture. Purée. You can add a little bit of water if the mixture is too pasty. 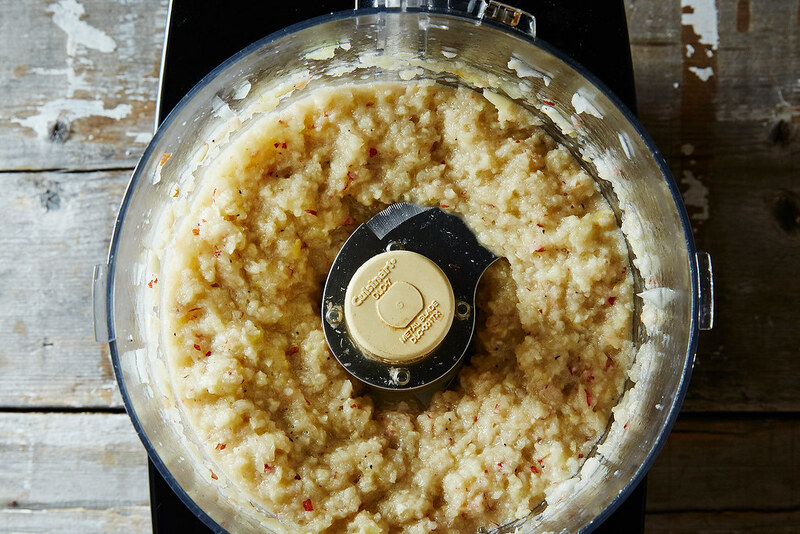 You should end up with something that’s about the consistency of applesauce. Stir in a bunch of scallions that have been roughly chopped, and a julienned carrot to give some texture to the purée. (If you’re making scallion kimchi, you can skip the scallions here.) Finally, toss in two big handfuls of gochugaru, the Korean red pepper flakes. 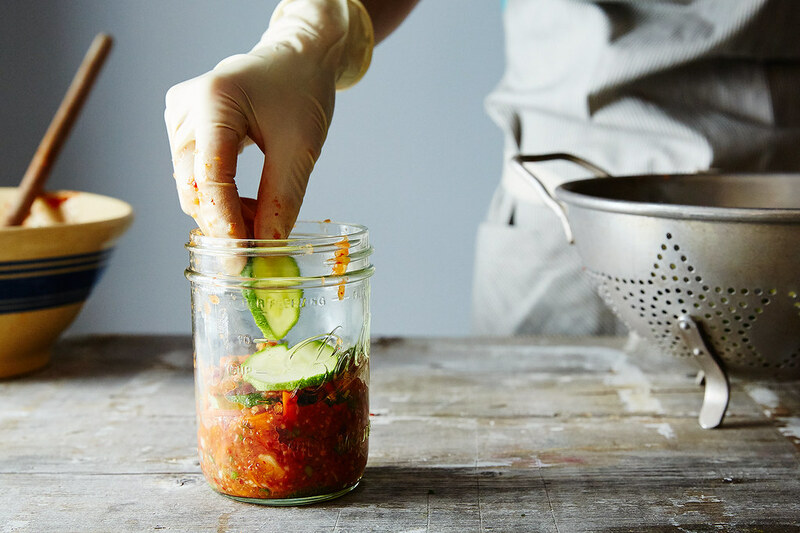 Let the kimchi sauce sit and marinate for at least 30 minutes, or up to 4 hours—the longer the better—at room temperature. Again, cover if you wish. 4. Test the salted vegetables. 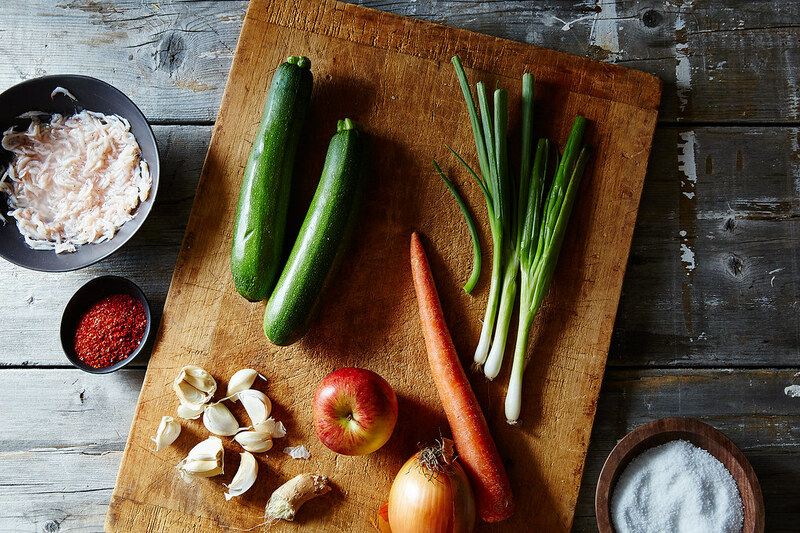 You’ll know your veggies are ready for saucing by their taste and texture. After a few hours of sitting in the salt, cut off a small piece, rinse off the excess salt, and taste. The salting will have given it a slightly sour flavor and tenderized it to the point where the snap is gone but there’s still a bit of bite. Think of a favorite kimchi you’ve had and match that texture. The kimchi won’t change much texturally as it ferments. 5. Combine the vegetables and the seasoning. Time for the fun part! Rinse your vegetables to remove excess salt and pat dry. You might want pull on some rubber gloves now to avoid having bright red, garlic-scented hands for the next few days. 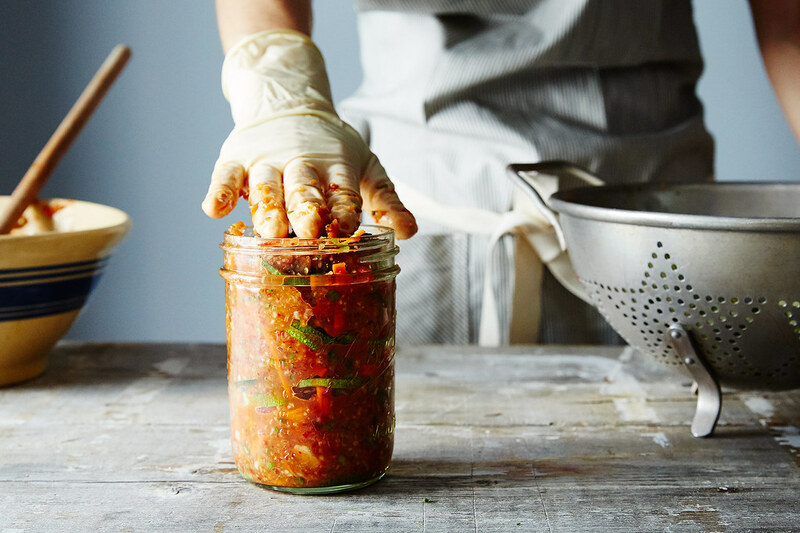 Gather your large bowl/container from before and the jars you’ll be using to store your kimchi. Now, pretend you’re making a lasagna: Pack in a single layer of vegetable and then cover generously with the sauce, like topping lasagna noodles with tomato sauce. Spread around and use your hands to gently massage sauce into crevices if need be. Repeat until you’ve used up all of your marinade. 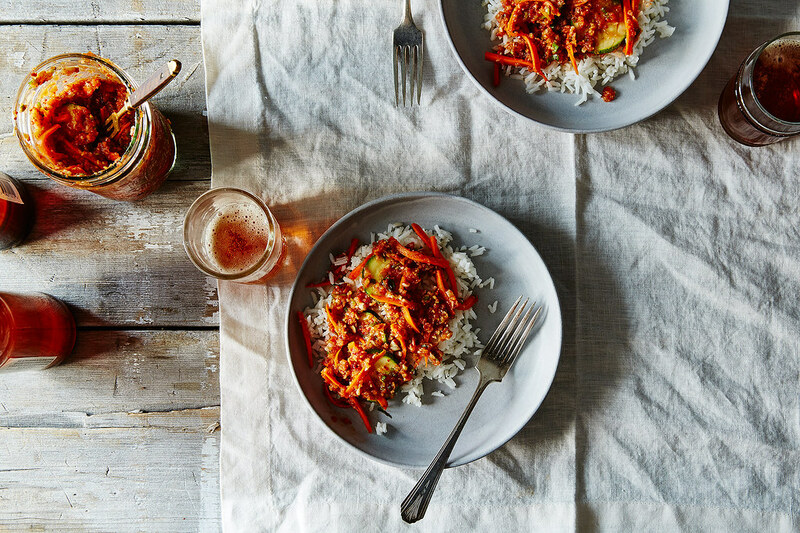 Pack your jar(s) with your sauced kimchi if you haven’t been already. Cover the jar’s opening with a layer of plastic wrap (it helps to contain the odor) and place the lid tightly on top. 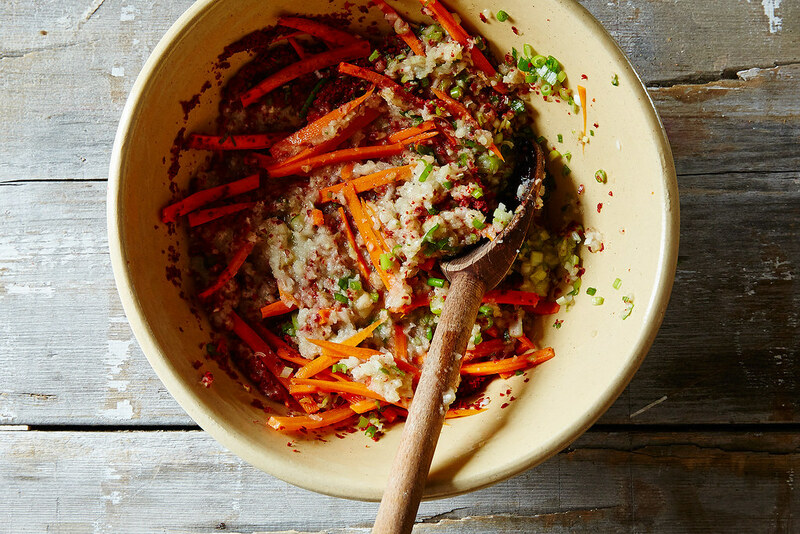 Leave your kimchi outside of the refrigerator overnight to kickstart fermentation. Taste it in the morning to make sure the funkiness has set in and then transfer to your refrigerator. Pro tip: After a few days, flip the jar upside-down and to distribute the goodness; just make sure the lid is secured tightly to prevent kimchi juice from spilling all over the fridge; flip back to right-side up a day or two later. Kimchi can be eaten right away, though each day that passes will deepen its flavors, and will keep for a few months. Some people believe kimchi never goes bad, but if you taste it and there’s an unpleasant “fizz,” you might want to skip. Kimchi’s shelf life decreases if you’ve included fresh seafood, like oysters, in your mix. But not eating the kimchi fast enough probably won’t be a problem. This article was written by Hillary Reeves from Food52 and was legally licensed through the NewsCred publisher network. Please direct all licensing questions to legal@newscred.com. Quick-pickled. Cooked into a pancake. Or, an attempt at recreating a top secret family recipe. However you make your kimchi, we can all agree this Korean specialty deserves its spot in the side dish limelight. Give some of our favorite versions a try: Easy Kimchi Slaw and Shrimp and Kimchi Pancake.